Add some other flag explanation to review tasks. Sometimes I want to flag a low quality answers which are a short comment or something (not a thank you comment) but I can't find any appropriate explanation in radio buttons so I choose "No comment needed." In addition there are some low quality question which are not compatible with any of radio buttons, so I prefer to skip these posts rather than report them. I suggest to add or change some explanations based on users similar experiences. I think the usual flags (not in review task, but in original page of posts) are better and less confusing. 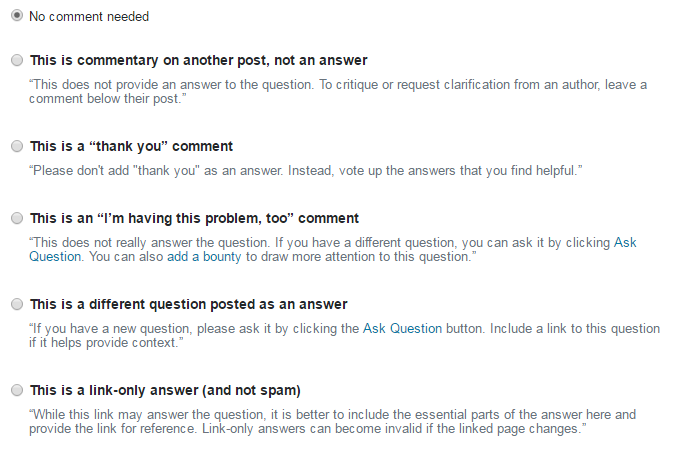 I suggest that the moderator post a question and ask users to contribute to adapt these explanation. Browse other questions tagged discussion feature-request editing review flagging . How to get review tasks? What is “very low quality”? Questions deleted right after receiving an answer: where to flag the users?